Smart features. Available in a choice of colors. Suits all weather conditions. The SadoTech Starpoint Expandable Wireless Doorbell measures up at 8.5 x 4.8 x 3.8 inches and weighs 12 oz. It is expandable as it allows you to add 20+ buttons, chimes and sensors within the same synchronized system. This makes it a great choice for large properties with several entrances. Finally, this wireless doorbell is both loud and reliable. Able to add 20+ buttons within the same synchronized system. Long range operation with the receiver at over 500 ft. 4 levels of adjustable volume. Only two frequencies with could be bothersome if a number of neighbors use the same system. The SadoTech Model C Wireless Doorbell is part of their fixed code C series which means that it has a maximum wireless range in open air of up to 300 meters as well as an operating rage of up to 500 feet. It also comes in a choice of colors such as blue, beige, pink, red, black brown and more! Operating range of up to 500 feet. Does not require batteries for any of receivers. 50+ chime sounds. Most difficult to stick to wall so be sure to invest in high quality screws. Upon purchase you will receive a wireless door chime, pre-programmed bell push button with CR2032 coin cell battery, mounting hardware and the instructions. The size is slightly bulkier at 1 x 4 x 5 inches and weighs 1.45lbs which is slightly heavier than other wireless doorbells on the market. Finally, it has a modern attractive look and flashing light notifications. Comes with a 1-year warranty. Automatically adjusts to avoid interference. Adjustable volume. Design is too bulky for some. Wireless doorbells are available on a variety of different budgets, with a variety of features in a variety of different sizes, colors and shapes. The fact that there are so many wireless doorbells on the market means that there is definitely one out there to suit your living situation. However, it is difficult to know which one to purchase without having the opportunity to 'try before you buy'. This is a frustration which we share so in turn, have decided to compare the best wireless doorbells on the market to ensure that your decision will be as stress-free and accurate as possible. Why Was the Ring Video Doorbell Pro Our Editor's Choice? This Ring Video Doorbell Pro is compatible with iOS, Android, Mac and Windows 10. In addition, the smart features mean that when live view is enabled you are able to keep an eye on your property from afar at any time. What's more, the camera is motion-activated, provides HD video and has a customizable alert zone. Installation is quick and easy, as instructions are clear and Ring even includes a toolkit upon purchase. In terms of price, it is on the higher end of the price range at just under $230 however we definitely think it's worth it. Why Do We Recommend the SadoTech Starpoint Expandable Wireless Doorbell? Upon purchase, you will receive 2 plugin receivers and 2 remote transmitter buttons. In addition, you will also receive double sided stickers for easy set-up, anchors and screws (for easy mounting on any service) and an A23 battery. In terms of design, this doorbell has a sleek, classic finish and is available in a choice of black or white. We really liked the fact that it can be set to different frequencies so if you have a neighbor that uses the same system then there will be no interference. 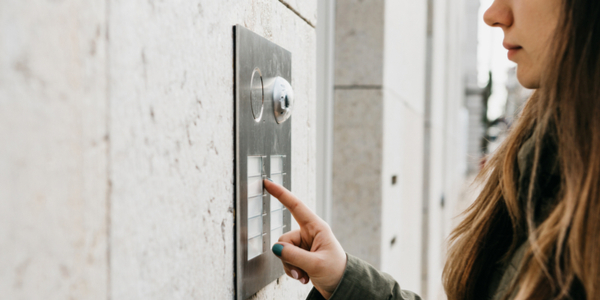 Finally, priced at just under $30 this easy-to-set-up wireless doorbell is worth every cent. Why is the SadoTech Model C Wireless Doorbell a Good Investment? The SadoTech Model C Wireless Doorbell has a good weatherproof rating of IP33 for the transmitter button and the fact that the doorbell has a thickness of 27.5mm means that it works well even in the cold winter weather. Upon order, you will receive the plug-in receiver unit, the transmitter button remote, screws, anchors, a double-sided sticker and a transmitter batter for the remove. The battery is alkaline type at 12 volts A23 for the transmitter and the receiver has an AC power for 110-120 volts at 50-60Hz. Finally, priced at just under $19 this is best wireless doorbell we tested that is the best bang for your buck! Why did we Decide to Compare the Honeywell RCWL300A1006 Premium Portable Wireless Doorbell? The easy-to-use icon visual alerts really stood out for us with this wireless doorbell which give it a nice, contemporary look. In addition, the Honeywell RCWL300A1006 Premium Portable Wireless Doorbell provides CD-quality sound with adjustable volume so the chime will never be a nuisance like with so many other wireless doorbells on the market. What’s more, the chime works up to 6 transmitters throughout the property making it easy to implement a variety of security measures and ensure that you and your family stay protected. Finally, priced at under $34 and with a warranty of 1 year, what do you have to lose? Why is the SkyBell HD Silver WiFi Video Doorbell a Good Product? Instillation is straightforward and the instruction manual that comes with this wireless doorbell is both clear and useful. If you are not however familiar with wiring and drilling into your own home then hiring a professional to do so is even simpler! On the whole, both day and night vision are clear and informative and night vision even offers a well-defined viewing at up to 20 feet. In addition, the app is easy to use and we really liked how the My Devices screen displays all connected doorbells with their name and a snapshot of what was last seen. Finally, you are able to get your hands on this swish doorbell for a bargain price of around $150! What did we Love About the Zmodo Greet Wifi Video Doorbell? For a smart device the instillation process is extremely smooth and straightforward and you'll have your smart wireless doorbell up and running in around 5 minutes. In addition, the design is modern and attractive meaning that you will be able to impress your guests with the aesthetics of the doorbell as well as its smart features. The Zmodo Greet Wifi Video Doorbell also has a feature called 'Quiet Hours' which you are able to activate if you are sleeping, reading or putting your child to bed, a feature that we really liked. This is the only smart doorbell that we enjoyed using at under $90 so it is definitely worth it! Why did the Novete Wireless Doorbell Kit Stand Out For Us? Aside from its many impressive features, the Novete Wireless Doorbell Kit stood out for us thanks to the fact that it is so easy to set up and such good value for money. All you need to is plug the receiver into a power outlet and attach the transmitter to the exterior wall. You have a choice of using screws or an adhesive patch and both are provided. In addition, the waterproof sender button is impressive too, It has a rated IP55 waterproof button which is functional between -4-140 degrees Fahrenheit meaning that weather will never be the reason that this great wireless doorbell stops working! Although you may not have considered it before, a wireless doorbell is almost crucial to any living space and the best ones on the market help you to feel totally in control over your family and your guests entering and exiting your home. Things to look for when debating which model to invest in are range, volume control, different chimes, smart features, power source and of course, price. On the whole, we found the Ring Video Doorbell Pro to be our Editor's Choice thanks to its smart features and its ability to function well in any weather conditions. Home chefs rejoice! Review of the best electric stand mixers to make your time spent cooking and baking so much easier! Check out the full electric stand mixer review comparison here!